For many, the 10k is the perfect race - long enough to provide a challenge, but short enough to still be attainable. If you’re on the fence about signing up for your first 10k, consider this: finishing times for the average recreational runner range between 50 - 70 minutes to finish this 6.2-mile race - that’s just a slightly longer than a STRIDE Signature Sweat class! You’ve got this. As you start training, it’s a good idea to start logging your runs and keeping track of mileage so that you can watch your progress and weekly mileage add up. Our 2 favorite tracking apps are Polar Beat (for outdoor runs) / Polar Flow (for Stride classes) and STRAVA (which you can use to track both indoor and outdoor runs). Below are 2 training plans to get your ready to run 10k: The 8-week training plan starts gradually with 2 runs per week and the 4-week training plan assumes you are already used to running 3-4 times / week. Choose the plan that’s right for you and your current fitness level. Below are a few terms to help you read your training plan. Stride Class: On these days, take the Stride class that’s noted, or whatever class you can get into. Whether it’s a Signature Sweat or a Power Burn, you’ll get some good speed- and hill-work in on these days. These days are all about getting you comfortable with pushing hard into your higher heart rate zones and building strength to prepare you to run. Outdoor Endurance Runs: These days are very important to your race training so don’t skip over them. 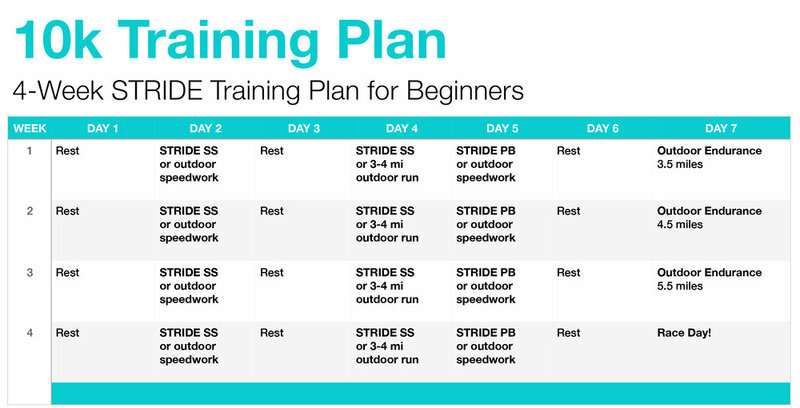 You’ll run outside and use this weekly run to build your base and endurance for race day. Your goal here should be to run slow(ish) and steady (think Level 2 pace.) Try to maintain a steady, quality pace, even if it’s slower than the goal pace you want to run during the race. Outdoor Speedwork: If you can’t make it to a STRIDE class, take your speedwork outside. Speedwork can be classified as training done at a pace faster than your Endurance Run (aka Level 2) pace. Using a timer, you can practice intervals outside. Think of what your Level 3 pace feels like at STRIDE (or use a watch or app to track your speed) and practice doing intervals of 1-4 minutes at that speed, with walking or light-jogging in between. Your rest days are an important key to your plan, so don’t skip over them. Resist the urge to run too fast on easy days. Your body needs time to adapt to your training and going too hard, too fast is never a shortcut. Final word of advice: don’t delay - start today. “Some day…” never comes, so lace up, book a Stride class, and jump right in! Questions? Email Leanne! I’m always happy to answer questions or help you troubleshoot your training.